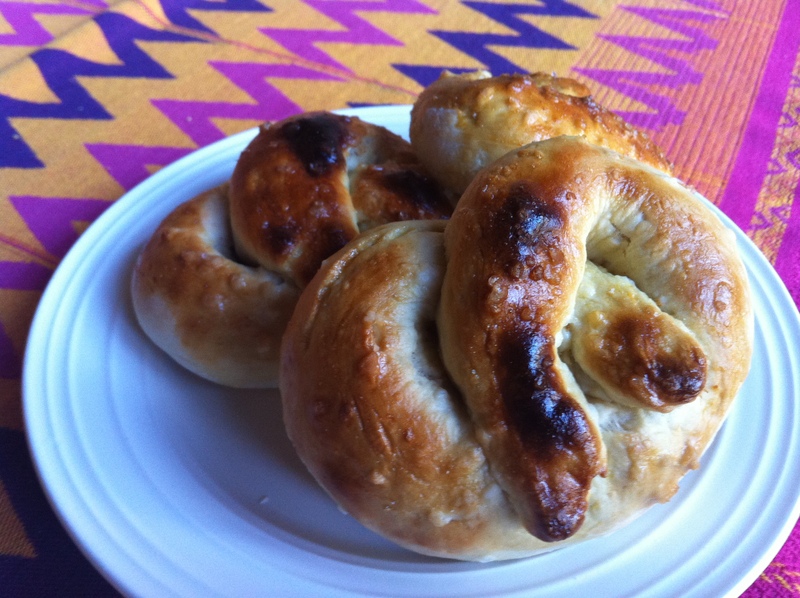 30-Minute Soft Pretzels – Voila! THIS IS VOILA’S 400TH POST! I was as skeptical as you are about pretzels that only take (about) 30 minutes from start to finish. I’ve made pretzels before. They are a labor of love! They take time! You have to use lots of flour and then they rise and then you boil water and baking soda before they even hit the oven. So when I saw a recipe for 30-minute pretzels, I was skeptical up until they came out of the oven. From the outside, they looked normal. They smelled good. And amazingly enough, they tasted great! Even without boiling them in baking soda – which helps give pretzels that crust on the outside and preserves the soft chewiness on the inside – these pretzels had that same texture. They were a little more doughy but nothing to complain about. I also liked that this recipe made 6 pretzels; a much more reasonable amount than 24 or 36! On another plus side, the dough could be a base to add raisins or after you dip the dough in the egg wash, sprinkle it with parmesan and/or garlic. Preheat oven to 425. Line baking sheet with parchment paper. Set aside. In a glass measuring cup, dissolve yeast in warm water. Stir with a spoon until fairly mixed, about 1 minute. Some clusters of yeast will remain. Add salt and sugar; stir until fairly combined. Let rise and become foamy for 8-10 minutes. In a large bowl, add the flour. Pour in yeast mixture. Mix with a wooden spoon until dough is thick.When it becomes difficult to keep stirring, turn dough onto lightly floured surface. Roll the dough into a rope with an even diameter. This measurement will depend how large you want the pretzels. Once you have your long rope, take the ends and draw them together so the dough forms a circle. Twist the ends, then bring them towards yourself and press them down into a pretzel shape. Bake for 10 minutes . Turn the oven to broil and bake for 3-5 more minutes to brown the tops. Watch closely to avoid burning. Pingback: Cream Biscuits | Voila!